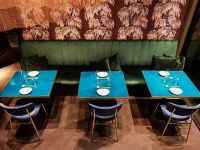 After ten years of trading in gentrified Scalo Romana area, Nishiki restaurant was ready for a makeover. 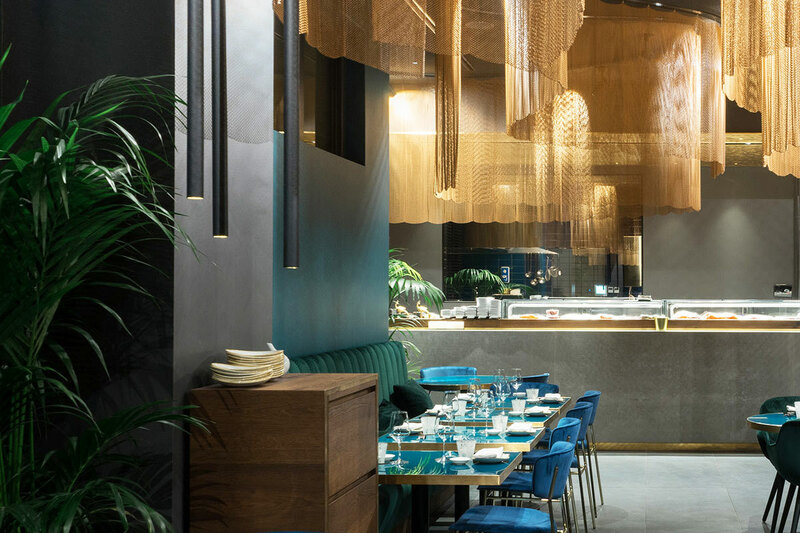 Chef owner Xiaobo and partner Alessandra requested design studio to deliver sophisticated interior inspired by natural elements of bonsai green. 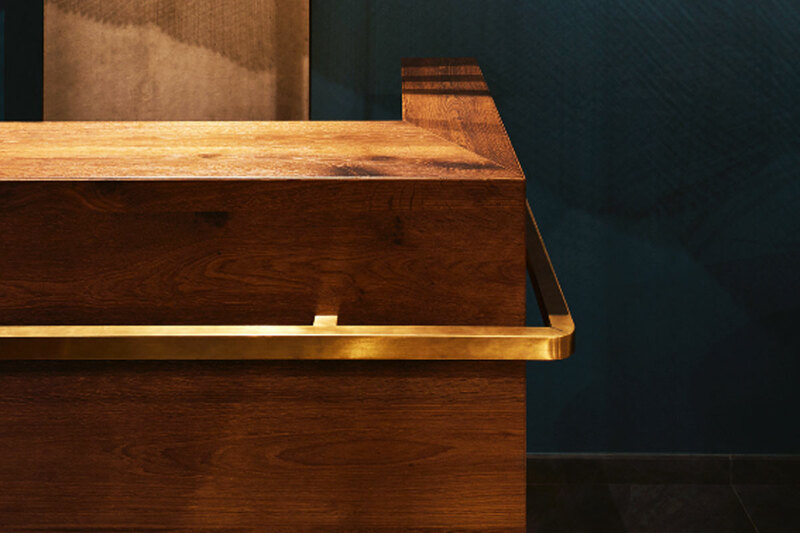 Attention to detail is evident right from the exterior. 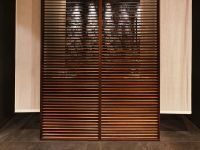 The entrance door fashions hand carved pivoting wooden handle whilst full height bronze windows allow glimpses into a teal blue interior. 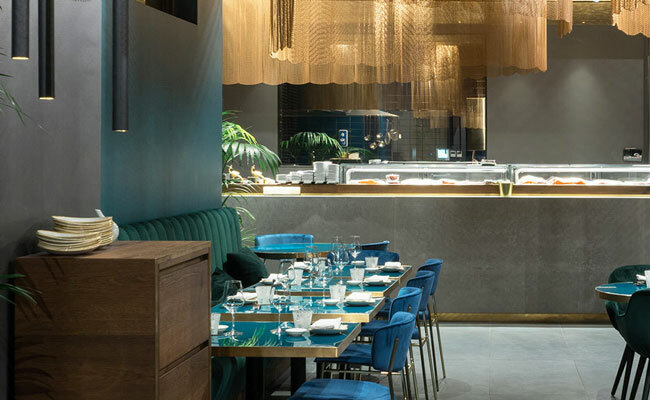 Interior Architects of Nishiki restaurant opted for richly pine green velvet sofas and blue chairs surrounding brass edged lacquer top tables. 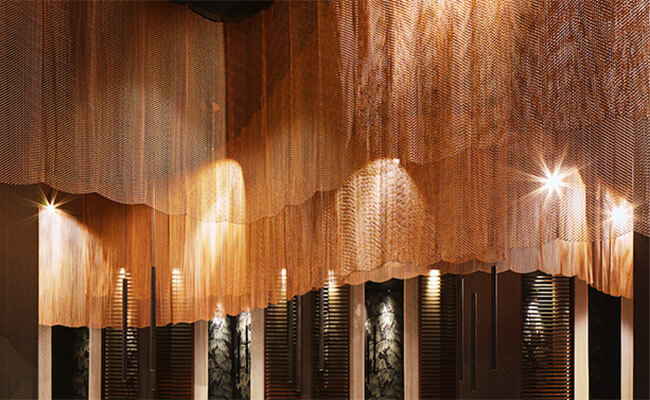 Further softness and sensuality are achieved through golden metal mesh suspended from the ceiling and beautifully illuminated. 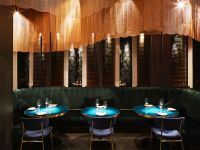 Nishiki restaurant architects were careful to retain popular tatami mats concealed behind the curtain for more intimate dinners. 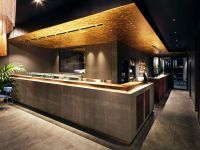 There are total of 5 tatami rooms with floral walls and dark timber framed acoustic fabric panels. 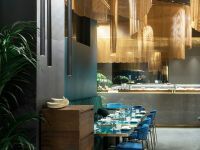 Dining space focal point is an oak and concrete clad sushi counter with brass accents whilst back counter is completed by blue glazed diamond shaped tiles. 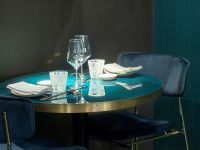 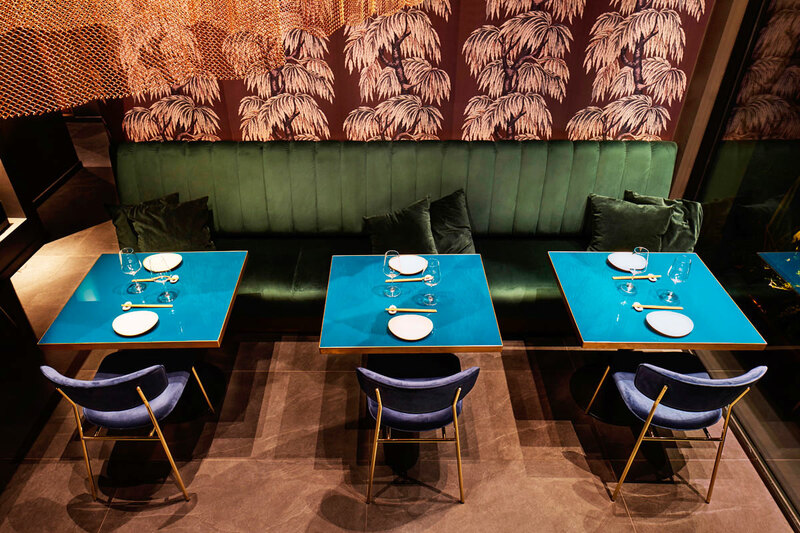 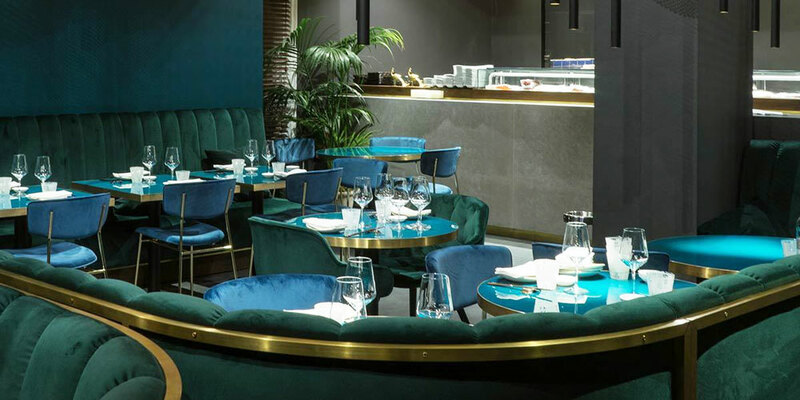 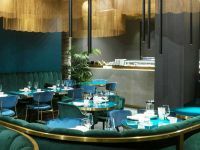 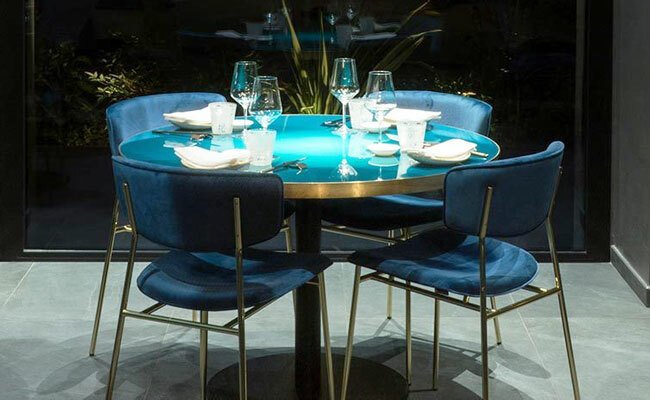 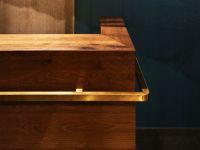 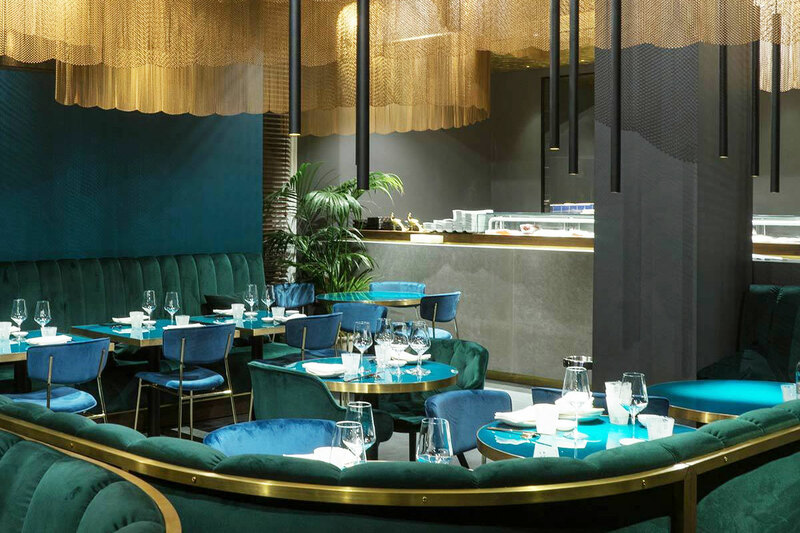 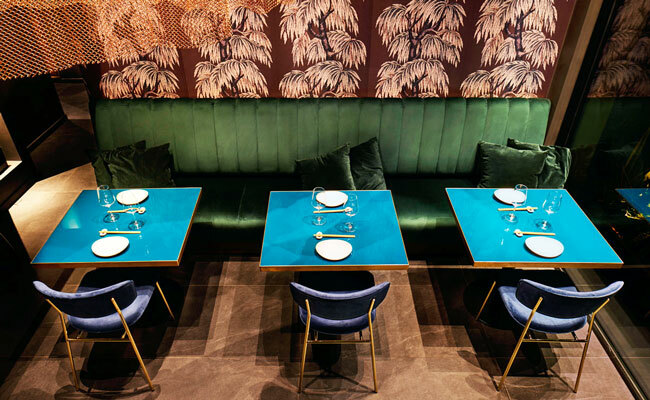 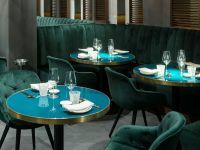 Nishiki restaurant designers extended the use of blue and brass theme onto the teal blue and emerald green lacquered table tops edged in antique brass. 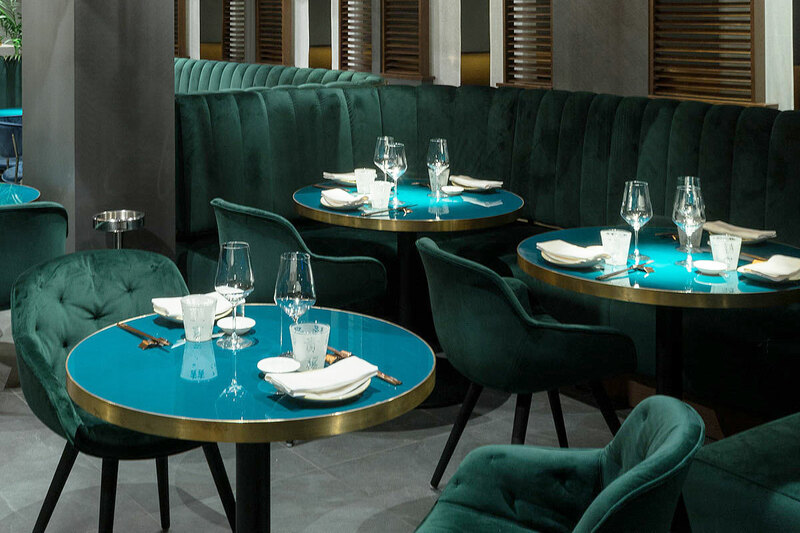 Brass framed forest green velvet sofas sit on black slate effect floor slabs. 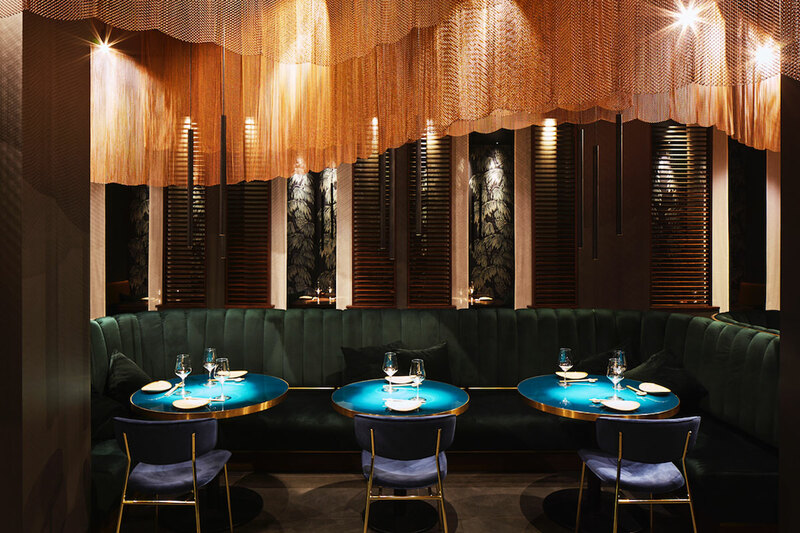 Blenheim Design friends at Linear Light used sophisticated adjustable and dimmable lighting system combined with Baton pendants to carefully highlight woven metal curtain whilst creating intimate dining atmosphere. 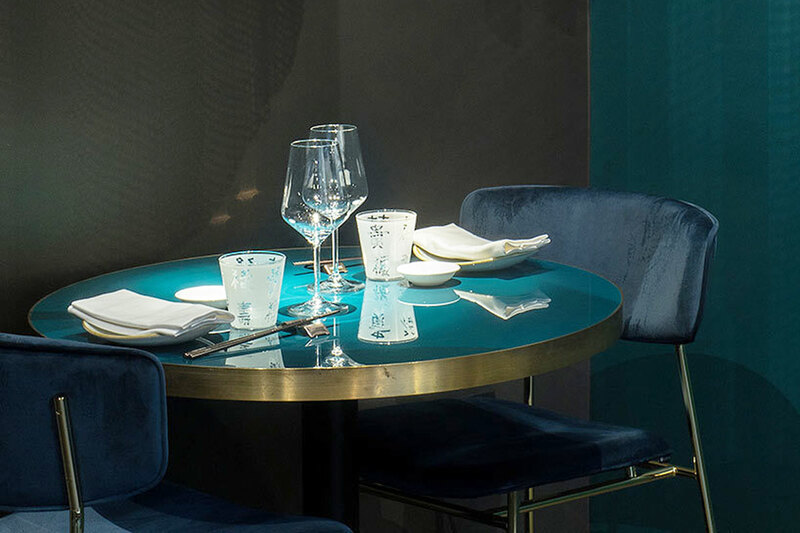 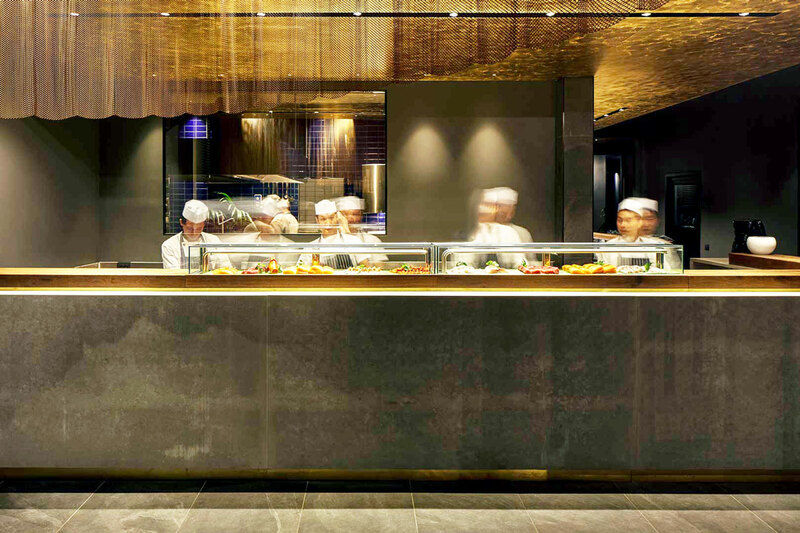 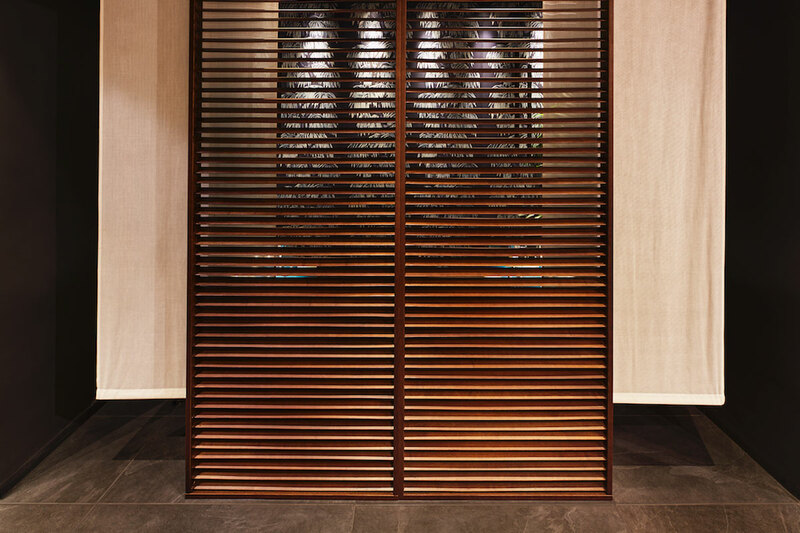 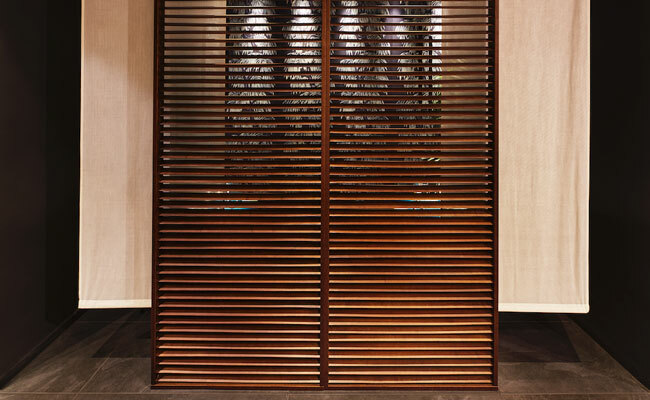 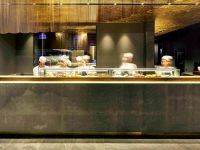 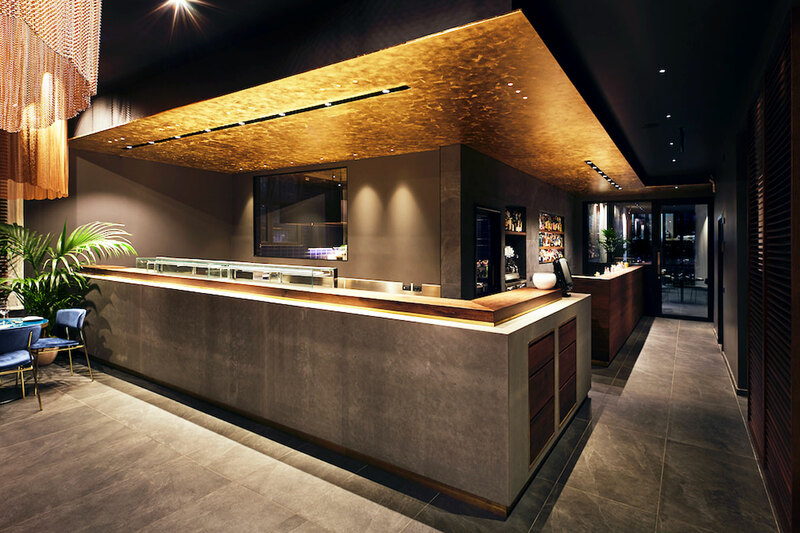 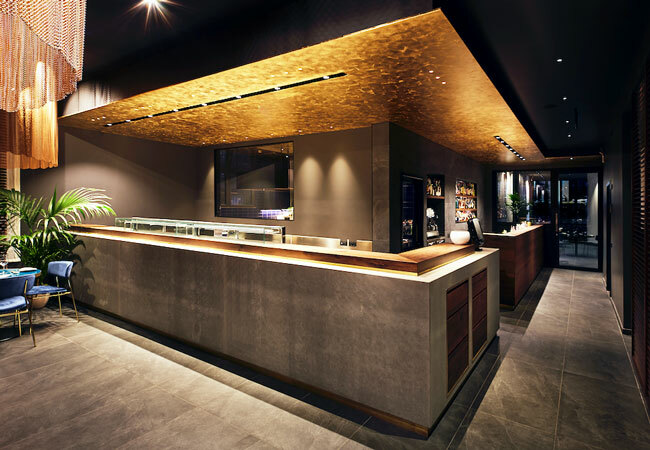 Sophisticated elegant and glamorous, Nishiki restaurant designers have created sophisticated, elegant and glamorous Asian dining in Milan.